Here's a look at kitchen design trends that experts believe will be popular in 2015, along with some "Fad Factor" predictions to help provide perspective on the ones most likely to stay in style. A simplified look is becoming increasingly popular, according to experts at the National Kitchen and Bath Association (NKBA). 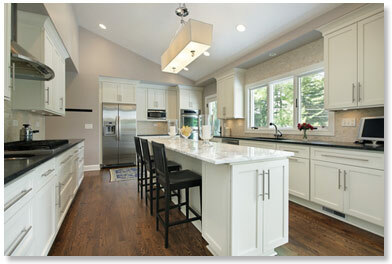 This means that design features with classic lines, such as Shaker-style cabinets, are in high demand. Around 40 percent of contractors who responded to an NKBA survey said they expected to install Shaker cabinets in a kitchen in 2015. Fad Factor: Low. In general, styles with straight, clean lines tend to have more staying power than those with ornate designs. More people add a second dishwasher and/or a double oven when designing or remodeling these days. Fad Factor: Low to moderate, depending on the home's price range. At higher price points "more" is likely to remain better, while in less high-end homes a shift towards increased energy conservation could tip the scale in the opposite direction. Homeowners are increasingly demanding a flex room known as a keeping room adjacent to the kitchen, to use for activities such as a children's play area, home office space, exercise room, or media room. Fad Factor: Very low. A keeping room has many potential uses that can be modified to meet a household's changing needs over the years. Gone are the days of clawing around in the back of a dark cabinet trying to find a piece of cookware you can't even see. Pull-out shelves and storage drawers make kitchen life much easier, and can be installed at a wide variety of price points. Fad Factor: Very low. 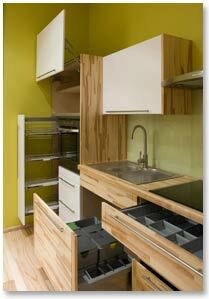 Slide-out kitchen storage is a huge upgrade in terms of ease of use. Touchless faucets are sensor-activated, making it easy to wash your hands without touching a faucet handle. (This is especially convenient after handling something like raw chicken.) Expect to see these much more frequently in newer kitchens. Fad Factor: Low. Anything that adds convenience and "Wow Factor" without being cost-prohibitive is a good bet. Steam ovens cook and bake using steam, which means that food cooks faster, less oil is necessary, and fewer nutrients are lost compared to boiling. They are increasingly popular despite being more expensive than standard ovens (roughly in the $3,000 to $12,000 range). Fad Factor: Low. Many owners rave about them in online reviews, and their health and time-saving benefits give them broad appeal. The NKBA survey reported that many kitchens now incorporate space for a flat screen TV, as well as a docking station for smartphones and tablets. Two-thirds of new kitchens have a home office or desk area. Fad Factor: Low. However, since requirements are likely to change with technology, it's a good idea to incorporate as much flexibility as possible. Calacatta MaxFine by MFG. Photo courtesy of www.irisfmg.com. Porcelain slab is said to be 30 percent more durable than granite, and can look like marble, wood, stone, and other materials. 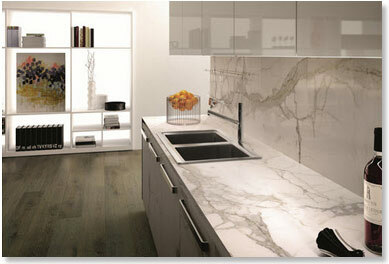 More common in Europe, it is catching on in the U.S. and generally costs less than granite or quartz. Fad Factor: Probably low, seeing as it appears to be very durable and comes in a wide variety of appealing styles. Granite and engineered quartz are still the most popular kitchen countertop materials, despite the fact that trend watchers have been pronouncing the doom of granite for years. Both are durable, easy to maintain, and heat-resistant. Fad Factor: Reasonably low, barring some fantastic lower-cost alternative (such as porcelain slab?) So far, granite and quartz have outlasted other trends because they are both attractive and very functional - two crucial elements of staying power. Tip: For those who don't want shiny counters, textured surface options such as "leather finish" for granite can provide a matte look that is appealing and distinctive. - U.S. home prices rose 4.3 percent year-to-year in November 2014, according to a recent S&P/Case-Shiller report. They rose 5.0 percent year-to-year in December according to CoreLogic, a data and analytics company. - The national average 30-year fixed mortgage rate recently dropped to under 4 percent. - The December 2014 Pending Home Sales Index rose 6.1 percent year-to-year, according to the National Association of Realtors®. Find out how much return you would be likely to get for various remodels. This review of a popular touchless faucet model on the Faucet Assistant website gives you a good idea of what features to look for. "Do a Full Day's Work in 90 Minutes"
A helpful review of various steam oven models. The link to the comparison chart is somewhat hidden in the post but you can see it by clicking here (opens as a pdf). It's hard to find good help! Codeable is a reliable source of reputable programmers if you need work on a Wordpress blog or website. Click here or on the image to see the video on the "I'm a Horse Addict" Facebook page. You do not need to be logged in to Facebook or have an account to watch the video. You are receiving this email because of your relationship with Jane Myers. Please reconfirm your interest in receiving this newsletter. If you do not wish to receive any more emails, you can unsubscribe here.